The Volvo Ocean Race 2008-09 is finally ready to commence on October 11. The 10th edition of the Volvo Ocean race is considered as the world’s premier global race and as one of the most demanding team sporting events in the world. TV audiences around the world will be able to view the race through Inmarsat’s FleetBroadband service as each racing yacht will be equipped with seven high definition cameras, a Thrane & Thrane Sailor 500 FleetBroadband terminal. Inmarsat and its partners Stratos and Thrane & Thrane are sponsoring the world-famous event, providing equipment and high-speed connectivity for all the yachting teams competing in this year’s race. 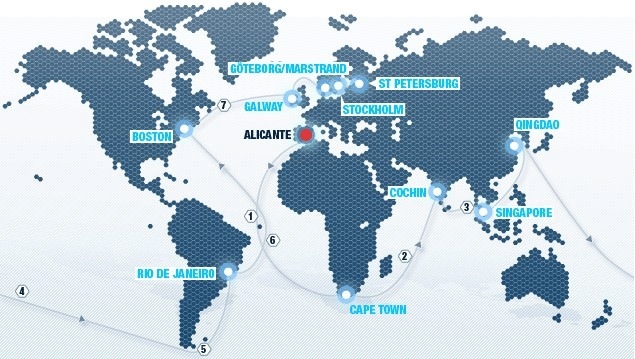 the first leg from Alicante (Spain) to Cape Town (South Africa) starts on October 11.
leg 1 crew list is here. The Volvo Ocean Race 2008-09 schedule is here. For the first time Cochin(Kochi), Singapore and Qingdao are stopover ports for this race. Here you play the official game – join the Virtual Volvo Ocean Race for free and be in with a chance to win a Volvo C30 or many other prizes! Here you register to get your updates on your mobile phones. Here is the coverage of the event by Inmarsat. Here is the official Volvo Ocean Race Image gallery and here is the video gallery. Interesting video clips on Volvo Ocean Race are here , here and here. For more details on Volvo Ocean Race 2008-09, log on to Volvo Ocean Race. Ian Walker, skipper, Green Dragon, said: “The leg from Singapore to Qingdao – I think is going to be the toughest leg of the whole race. I’m sure we get the most upwind and the coldest weather on some of the roughest seas, so it is representing a whole new challenge to both the hottest and coldest part of the race.” Read more from Channel NewsAsia. The Volvo Ocean Race has begun and there is a bigger Asian involvement this time. Read more from Channel NewsAsia. A prize purse of 20,000 Euro (US$27,500) is on offer by Inmarsat to the onboard media crew members who produce the best material throughout the nine-month Volvo Ocean Race. Read more from Inmarsat. Also here are some photographs of Volvo Ocean Race – Leg 1from Sail World. Day 6 summary of Volvo Ocean Race is at VOR Press Information. Ericsson 4 has come first in Leg One of the Volvo Ocean Race. With the win on Leg One, Ericsson 4 will pick up eight points, to climb to the top of the table with 14 scoring points accumulated so far in the race. Read more from Volvo Ocean Race. Here are the Prize winning details of Leg One. Leg two of Volvo Ocean Race is scheduled to start at 1300 hours local time (1100 GMT) from Cape Town on November 15. The race from Cape Town to Kochi (Cochin) is 4,450 miles and the leader is expected to finish around December 03. Read more from Volvo Ocean Race Press. Leg two of Volvo Ocean Race has commenced. Read more from Volvo Ocean Race. Ericsson 4 racing team has won the second leg of the Volvo Ocean Race, skippered by Olympic gold medallist Torben Grael of Brazil by crossing the finish line at Kochi on November 30, early morning. Read more from The Hindu Business Line. Leg three of Volvo Ocean Race has commenced from Kochi (Cochin) today. For colorful coverage, log on to Giirayachts. Volvo Ocean Race press release is here. Telefonica Blue has come first in the leg three of the Volvo Ocean Race on December 22. Delta Lloyd has finished last. Read more from Volvo Ocean Race here and here. For further updates, log on to Volvo Ocean Race 2008/2009.